$5,200 per week Off Season: 10th July - 5th November. $6,100 per week Low Season: 1st May - 9th July and 6th Nov - 15th Dec.
$6,900 per week Mid Season: 2nd Jan - 31st Jan and 1st April - 30th April. $7,600 per week High Season: 16th Dec - 1st Jan and 1st Feb - 31st March. 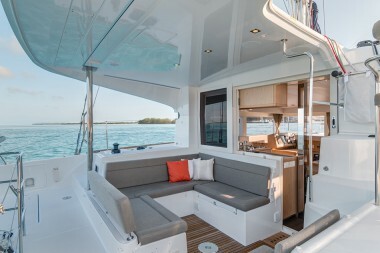 The innovative Lagoon 39 belongs to a new generation of sailing catamarans. 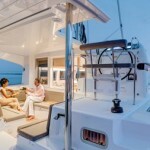 Sophia makes a striking first impression with beveled vertical bows and her mast set well aft. 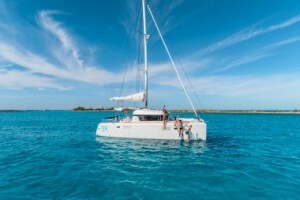 The rig is designed to reduce the size of the main while increasing the size of the genoa, making the boat easier to sail. The starboard side raised steering station, with a comfortable double seat, has direct access from the cockpit and deck and provides good visibility. 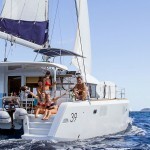 All sheets and control lines lead to the helm making her an easy boat for one person to sail. 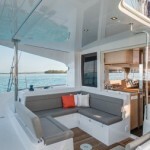 The integral hard top bimini covers the cockpit and has a sliding panel over the helm. 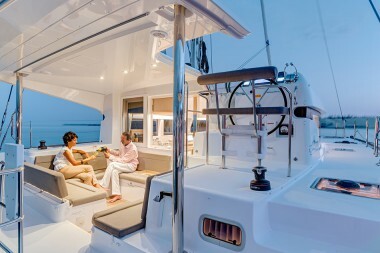 The cockpit has a removable dining table with U-shaped seating for six plus additional seating on starboard. A folding swim ladder with two integrated handrails provides easy access to the dinghy & sea. Cockpit and saloon are on one level. 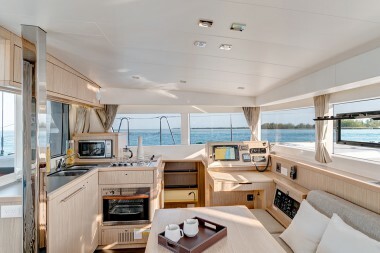 The port side galley faces aft with a large opening window enabling the chef to mingle with friends & family while preparing meals. 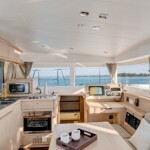 The galley is well equipped with double stainless steel sinks, stove, oven, refrigerator and ample storage. The navigation station to port is side facing and provides excellent visibility. 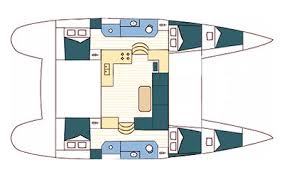 The saloon is “L” shaped with a large dining table and comfortable seating. 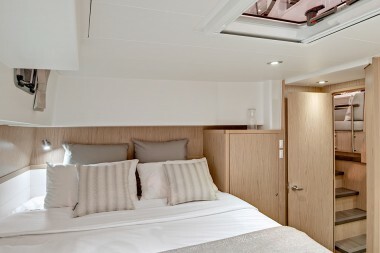 Each of the four cabins has a double bed, fan, reading lights, hanging locker & plenty of storage. 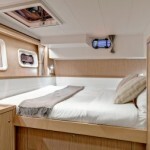 The heads, located mid-ship in each of the hulls, are a good size with a separate shower compartment. 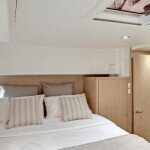 The interior is finished in light Alpi wood with white ceilings & moldings. 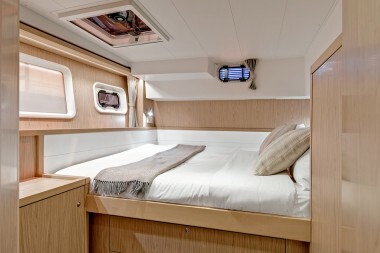 Large windows in the saloon and cabins fill the interior with natural light. 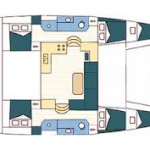 With a generator and air-conditioning, this Lagoon 39 will enable you to enjoy a comfortable sailing holiday whether in a marina or on anchor.